Dedicated to preserving Los Angeles' historic theatres. Below are some photographs from the meeting. Click on any photo to see the full-size version. Scroll below the photos to read a summary of the meeting, and LAHTF's reaction to it. 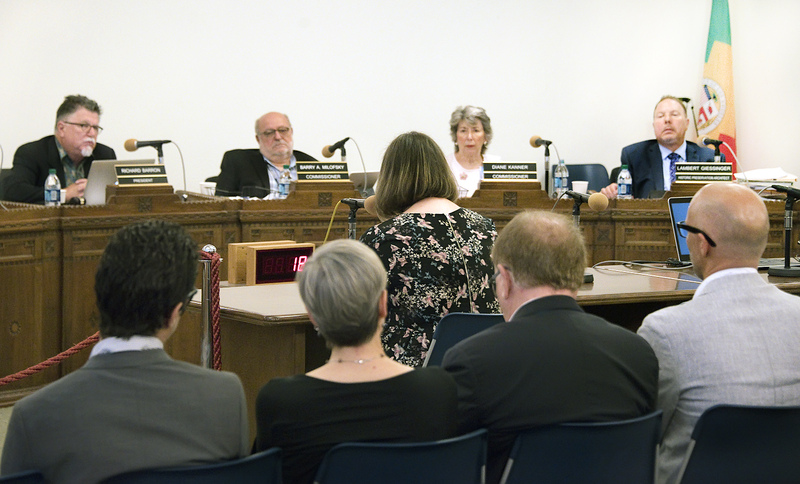 To read LAHTF's position statement on the Tower Theatre project click here. 1-15-2019 - NOTE: Renderings and plans presented at the Cultural Heritage Commission hearing on August 2, 2018 were preliminary and subject to change as the project progresses. When Apple releases updated documents we will share them here. A presentation was given to the CHC panel by architect James McGrath of Foster + Partners, who is the lead designer on this project. Mr. McGrath is based in San Francisco and has worked with Apple on many prior projects. The marquee on Broadway will be restored to original design. The top of clock tower will be restored to its original condition (the top was removed after an earlier earthquake). Some of the other original historic features will be restored. The presentation then focused on details of the current plans for repairing and/or replacing various historic elements. 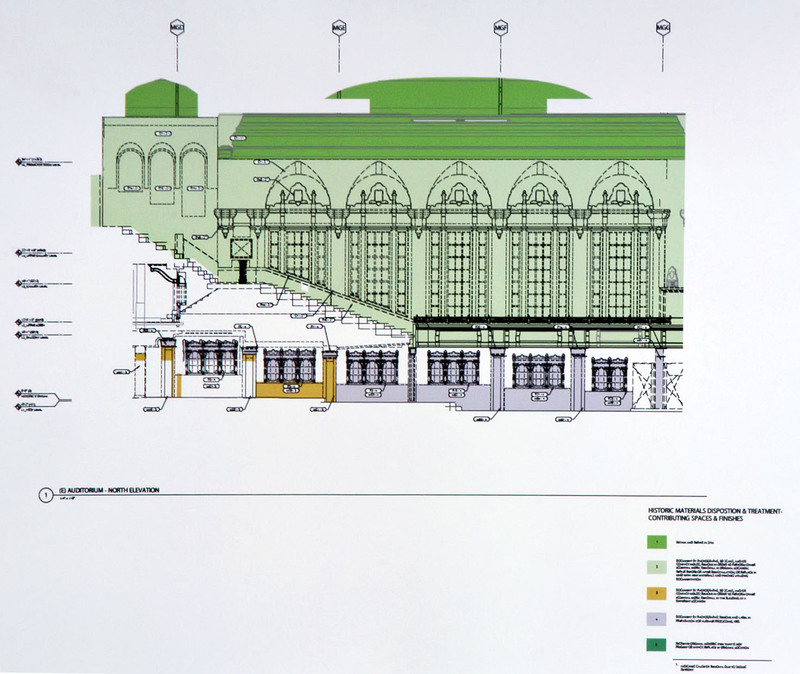 Seismic work was briefly outlined: the requirement for strengthened shear walls, foundations, beams and columns to tie walls and floors together, and strengthening of the theatre’s balcony. 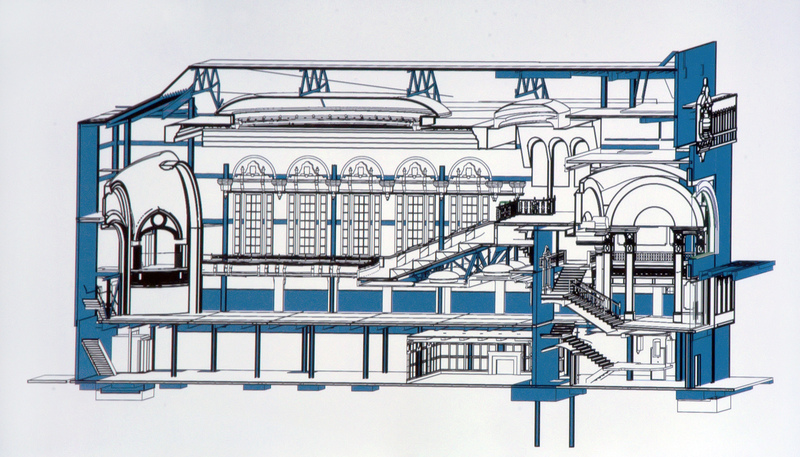 According to the current plans 80% of the theatre’s historic surfaces will remain visible and in their historical context. Historic elements that must be removed will be preserved and stored on-site or locally close by in a Delijani-owned property. The 8th Street façade’s existing street level retail units will be opened-up to provide direct access from the street into the main auditorium. The marble removed from this wall will be cataloged and stored. 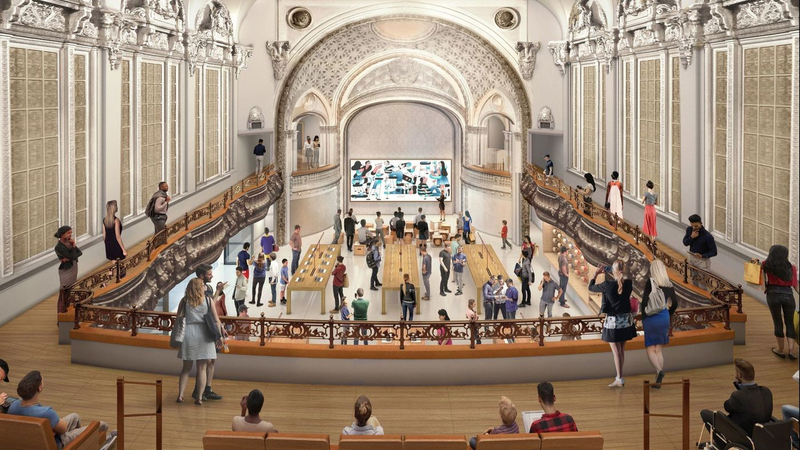 Apple envisage this as a place for musicians to perform, to host live events, and perhaps even host movie premieres. It will be a place to learn and gather; a community space, and will have a theme of entertainment, movies, and music. Lastly, there was a Q&A from the CHC panel. Some of the questions included discussion of Apple’s previous work in historic buildings with locations including Paris, London, the Upper East Side of Manhattan, and the Carnegie Library in Washington DC. Taking inspiration from the building, the Carnegie project’s site has a theme of books & education, whereas the Tower Theatre’s site will takes its inspiration to foster a theme of entertainment, live music, and movies. The panel noted that the interior was “going white”, and asked if Apple will be documenting the historic color scheme. Mr. McGrath answered that the current plan is for off-white with gold and bronze highlights. The panel asked if there are any other entertainment-themed Apple Stores or if this will be Apple’s first. Mr. McGrath answered that although the Chicago store is somewhat entertainment-inspired it is not to the extent that this Los Angeles store will be. 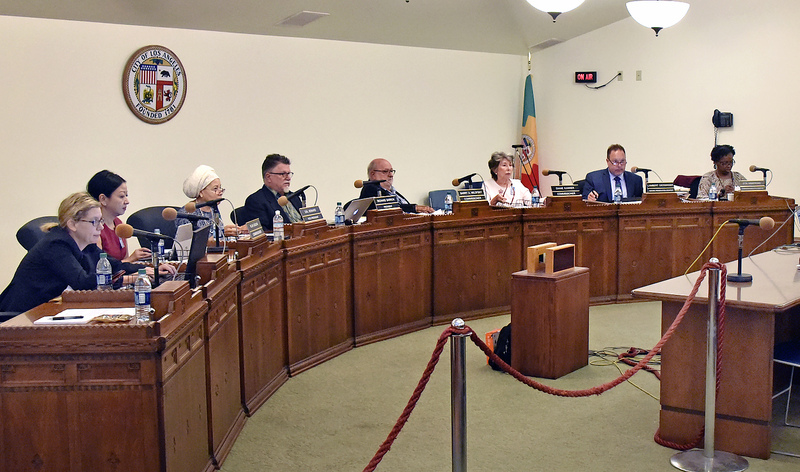 Adrian Scott Fine of the Los Angeles Conservancy stated they were pleased that the Conservancy and the Los Angeles Historic Theatre Foundation are working closely with the project team, and felt that good progress is being made. It was noted that this is a big project in a special building, significant to not just Broadway but all of Los Angeles. The Conservancy is working through the specifics of adaptive reuse and balancing reactivation with the historic nature of the building. LAHTF President Tiffany Nitsche delivered the Historic Theatre Foundation’s position statement as outlined in our previous email. Katie Kiefer of Councilmember Huizar's office stated that Councilmember Huizar is very supportive of the project. The Councilmember's office will continue to work with all parties to ensure the project is a success. Closing comments from the CHC panel included Richard Barron (President) noting his support. Gail Kennard (Vice President) is happy to see the building come to life again, while Commissioner Pilar Buelnar supports the adaptive re-use, noting at the same time that it’s a historically significant building. Commissioners Diane Kanner and Barry A. Milofsky declined any comment on the project. 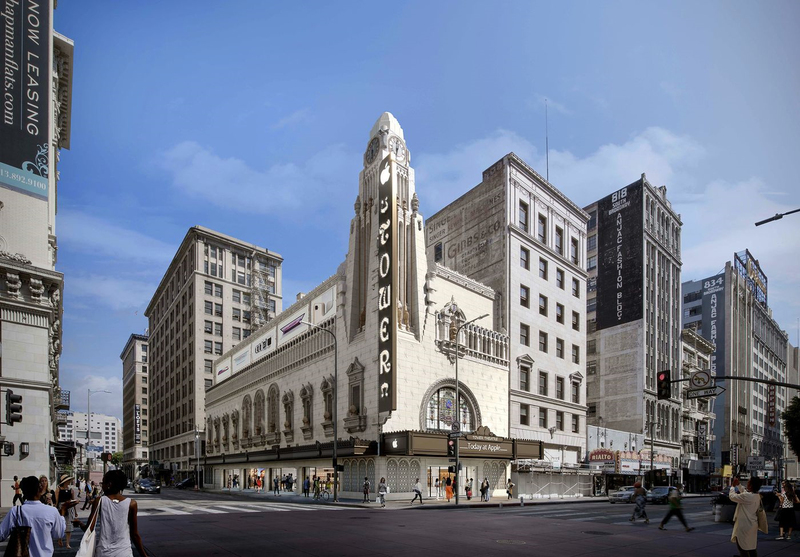 While there will be a primary non-theatrical use of the Tower Theatre, LAHTF is encouraged by the current plans to incorporate live events, recognizing the important part the Tower Theatre and the Broadway Historic Theatre District have played in the evolution of Los Angeles and the Entertainment Industry. 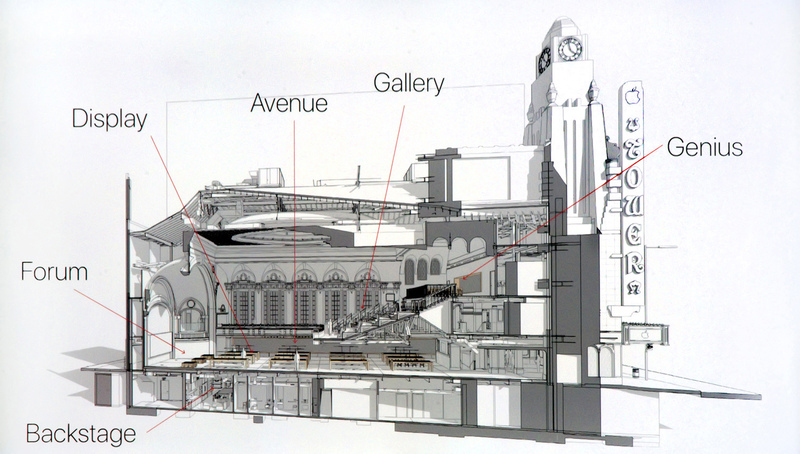 Whereas final plans and/or renderings of all areas of the theatre are not yet available, LAHTF is cautiously optimistic at the proposed plans and progress to date. We look forward to hearing more about the live programming element as the project evolves. 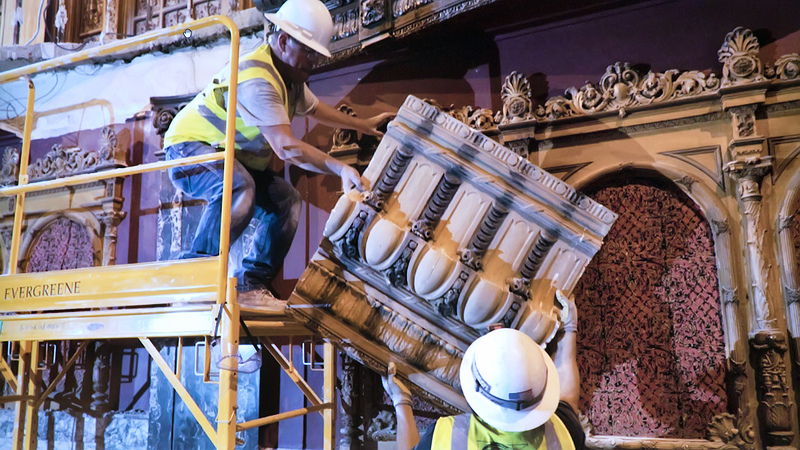 LAHTF will continue to advocate for the protection, preservation, and restoration of the historic theatrical elements of the building by closely monitoring the treatment of all unique and character-defining features to ensure that as much as possible is restored in place, and that any historic elements which must be removed are preserved and protected on-site. If you have questions or comments about the activities and programs the Los Angeles Historic Theatre Foundation sponsors please feel free to contact us.